Spring has sprung! Well, according to the calendar it has, but it's not feeling much like spring here in the Northeast right now. We did have a little taste of it about a week ago though - what a tease! Before I knew we were going to have such nice weather I had planned on roasting chicken, but then I saw that it was going to be 65 and sunny and I immediately told Jon he was grilling. Now, we grill year round, but there is something special about the first time you can grill on a nice, spring like day. You can actually stand outside and tend to your grill instead of running in as soon as you get things going. Even better, our little one was beyond excited to run around outside while her daddy was grilling. This summer is going to be so much fun with her! The warmer weather makes me want to eat lighter, so I chose chicken and romaine lettuce to go on the grill - if you haven't tried grilled romaine lettuce, you must! It's my favorite way to eat it. I thought about making this Grilled Romaine with Bacon Balsamic Vinaigrette and Blue Cheese but then found this recipe for Chicken Skewers with Grilled Romaine on the Food Network web site. It looked easy, light, and I liked that you made a dressing that was used as both the marinade for the chicken and the dressing for the romaine. Besides the time Jon spent on the grill, I think I only spent 10 minutes between trimming the chicken, mixing the dressing, and prepping the romaine. Instead of making chicken skewers we just grilled chicken breasts. Jon grilled them perfectly, and they really held a lot of flavor from the marinade. 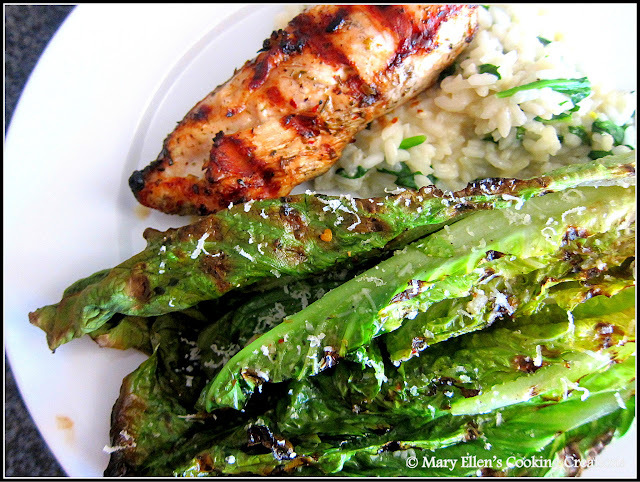 The grilled romaine was wilted and charred just enough - smoky and charred but still with some crunch. I'll be putting this one back on the menu again when we're looking for something light, quick, and easy. I think it would even be great to make some extra and chop it up for salads to enjoy for lunch the next day. Place chicken in a Ziploc bag or shallow dish. Pour half of the dressing over the chicken, making sure it is all covered, and let it sit, covered, in the fridge for several hours (the longer the better). 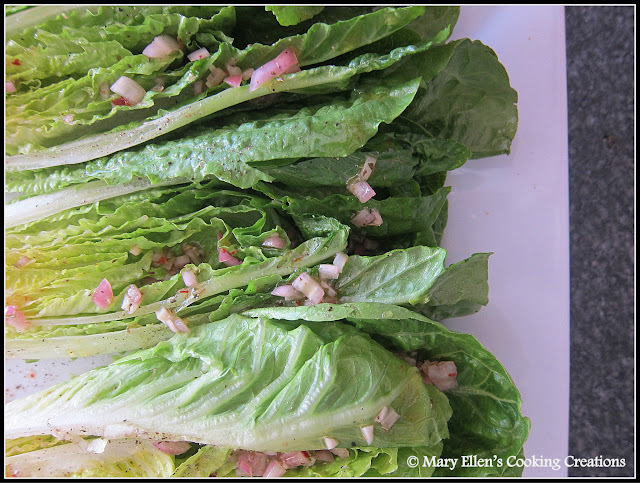 Drizzle the romaine lightly with olive oil and season with salt and pepper. Pour the remaining dressing (note - NOT the dressing that was mixed in with the chicken, but the other half of the dressing you did not use) over the romaine. Heat your grill, add the chicken and grill until the internal temperature reaches 170. When you are grilling the chicken, don't flip it around too much. Start it on one side, flip once, then flip to each side just one more time. When the chicken is done, remove it from the grill and tent with foil. 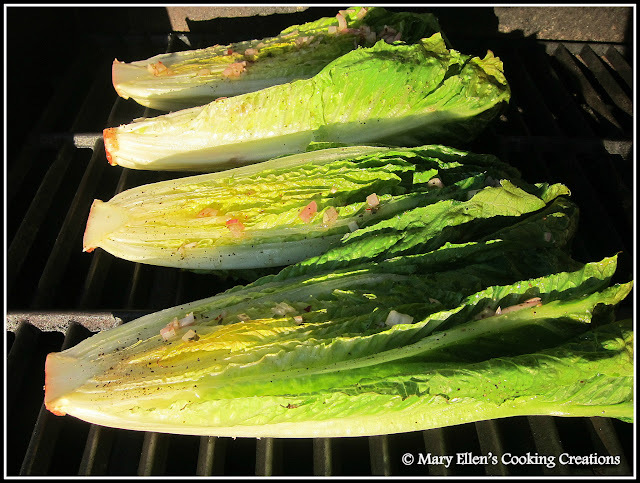 Add the romaine to the grill and cook 3-4 minutes until wilted and charred. Before serving, sprinkle the romaine with the Parmesan cheese. I loved grilled romaine! Bring on spring! always wondered how to make the grilled romaine. Silly me - it's so simple but I've always been afraid to try it! I know, right? Okay, I LOVE THE NEW FORMAT of your blog. I MUST HAVE THIS! I need some tips/pointers and the contact of the person who designed the site! Loving the index page and teh photos. Really, congrats! It's gorgeous! Thank you so much!!! I'm really happy with it. The logo design and help with figuring out my "look" was done by www.derrickclee.com and the web design was done by ShinyMagic Designs. Email me if you want more info! Hope all is well!